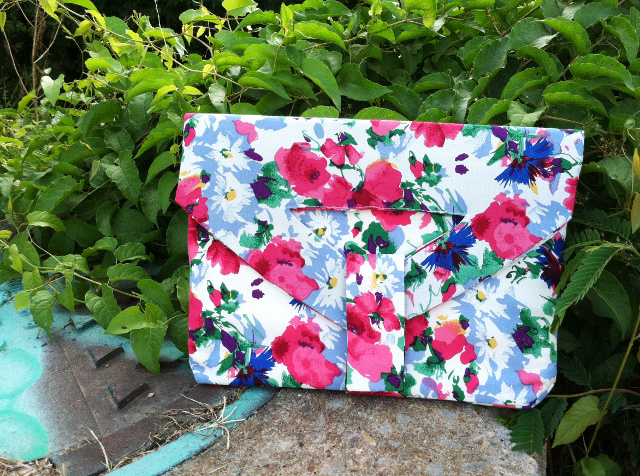 *Quick note: This clutch is not quite as stiff as a clutch you would buy in a store. After completion, I slid in a piece of thin cardboard to help the clutch retain a stiffer shape. 1. 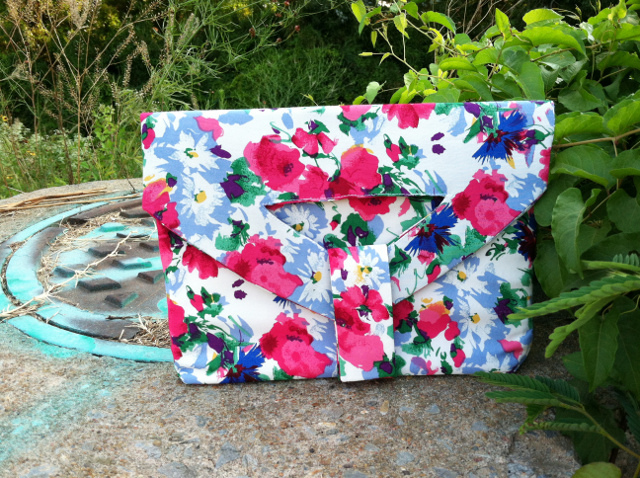 Make a pattern for your clutch. I used 1 & 2/3 pieces of regular printer paper and my pattern measured 14 inches from point to end, and 11 inches in width. 2. Cut two pieces of fabric and two pieces of thick interfacing to match the size of your pattern. I didn't include seam allowances on my pattern so when I cut out my fabric, I had to allow for that. I also used one piece of thick interfacing and one piece of thick, black canvas (if you see that in later pictures). I was just trying to use up random project leftovers.. 3. Baste interfacing on to fabric pieces. Cut slits in the middle of the triangle opening, fold fabric to backside, encasing the interfacing, and baste down. See image 4. Repeat this for the second fabric piece. 5. Fold your pattern where you want the fold in your clutch to be, and cut two pieces of fabric to fit the rectangle you just formed, this will be part of the lining. 6. Now, cut 2 pieces of fabric (same kind of fabric as used on the outer clutch pieces) to fit the top of the part you folded down (See polygon shaped fabric piece in image 7). 8. Stitch your rectangle and polygon shaped lining pieces together with wrong sides together. Repeat for other lining pieces. 9. Press open seams formed in step 8. 10. 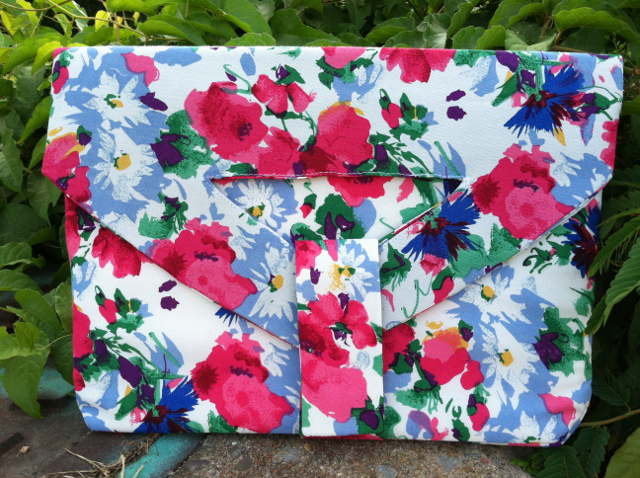 With wrong sides together, place lining piece on top of outer clutch piece, matching triangle points. Permanent stitch along the two, angled sides leading up to the triangle point. Trim seam allowances, turn inside out and press. Repeat for the other set of outer clutch and lining piece. Now, cut slits in the lining piece inside the triangle, fold under, and permanent stitch in place. Image 11 shows how it should look when this step is finished. 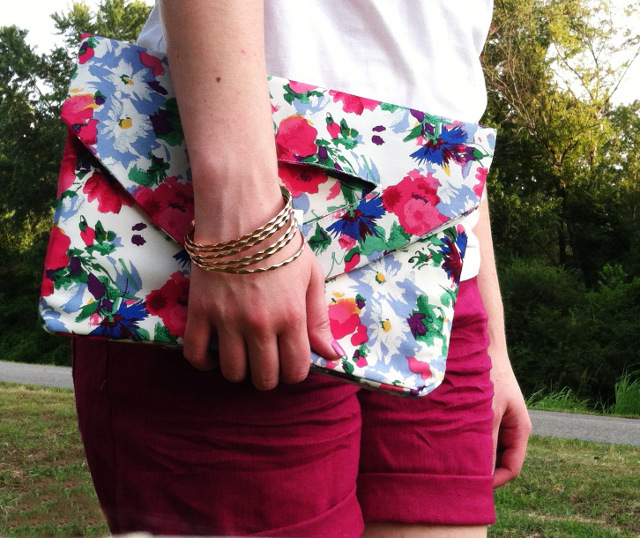 Repeat for other clutch piece. 12. Now we'll make the piece that will hold your clutch in place when it is folded down. My pieces (before sewing) measured 9 inches long by 2 inches wide. You can make yours skinnier or thicker, it's up to you. Cut two of fabric and two of thick interfacing. Iron on your interfacing to wrong sides of fabric strips. 13. With wrong sides together, sew the fabric strips together, leaving one short end open. Turn inside out and press. 14. Place on your clutch where you want it to be. Make sure when the top of the clutch is folded down, your fastener strip is the correct length. Pin the raw edge of your fabric strip to the raw edge of the clutch for now. 15. For the base of the clutch we'll make a small rectangular section. Cut 1 piece of fabric, 1 piece of lining fabric, and 2 pieces of interfacing (for thickness). 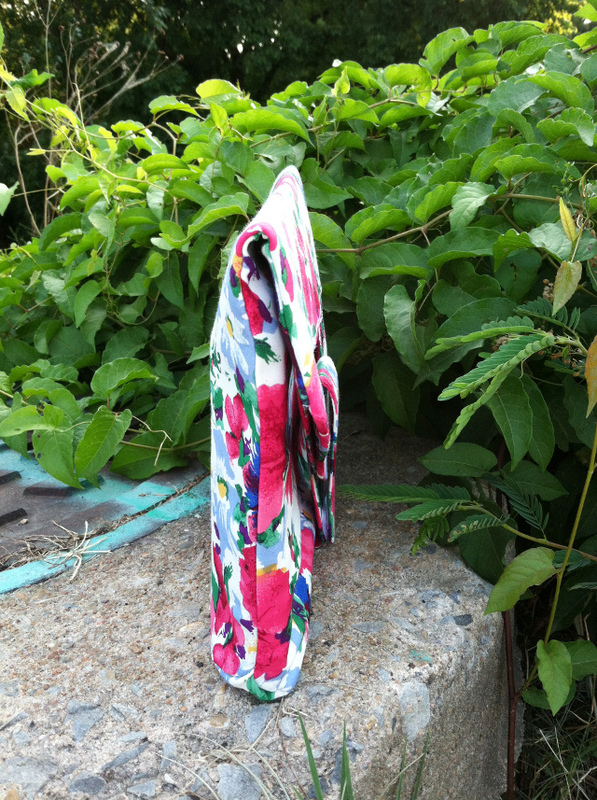 My fabric pieces was a wide as the width of my clutch pieces (11inches) and about 2 1/2 inches wide. Sandwich your interfacing between the fabric and lining piece, baste in place. 16. With wrong sides together, line up the raw edge of your front clutch piece with the one of the raw edges of your base piece. Make sure your fastener strap piece is where you want it because you'll permanent stitch these pieces together. 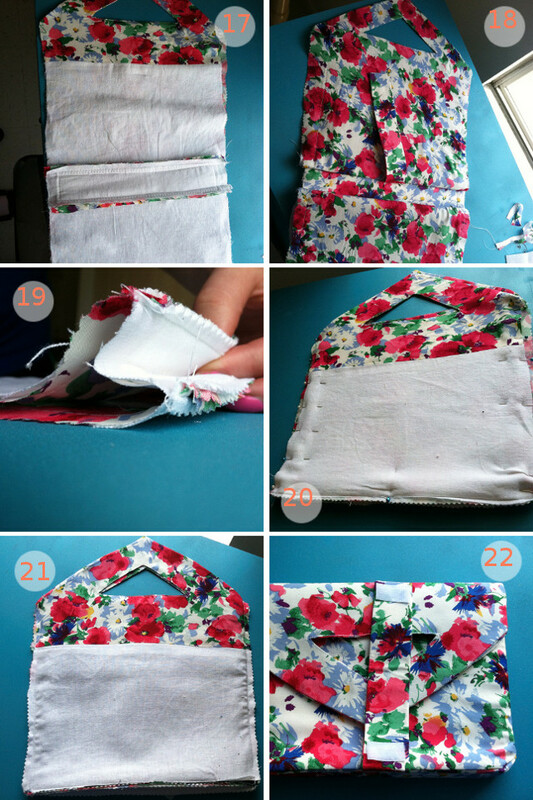 (Remove those pins you placed in there during step 14..so you don't run over them with the sewing machine! 17. Now attach your other clutch side to the other raw edge of the clutch base piece, with wrong sides together. It will look like image 17 & 18 when completed. 19. With right sides together, line up triangle points and clutch sides. Pinch in the base piece so that side seams line up. 20. Pin in place. 21. Stitch side seams of clutch. Trim with pinking shears, or serge. Turn inside out and press. 22. Attach Velcro pieces to ends of your fastener pieces. *Note: I used hot glue because I didn't want to hand sew (it is sturdy enough for my purposes for this simple clutch, I'm not going to be filling it with bricks! :) If I would have sewed these the Velcro pieces on with the machine there would be stitching lines on the outside of the fastener pieces. If you wish to permanent stitch on the Velcro pieces, it would be best to do it before you sew the two fabric strips together in step 13.